The December edition of Greg’s Guys is here! In case you are unfamiliar, “Greg’s Guys” is is a rotating list that takes a few factors into account. It wouldn’t be fun if I just listed the top 10 players in the nation so I compile the list based on Nebraska’s needs, how a player fits in the scheme and talent. The player also needs to be interested in the Huskers. The other wrinkle in this if you’ve been following along throughout the season is Nebraska has obviously made a staff change, completely overhauling the recruiting board. Also, the new staff is all over junior college recruiting so for the first time the list will include JUCO players. I’m also going to break my own rule and include committed players on the list because it’s poaching season in recruiting. There are some good football players that were just on the cusp of making this list and some tough choices had to be made. Quick note, current committed players don't make the list. Without further ado, here’s the list and it's fluid as the new staff settles its recruiting board and players show increased interest. The Tennessee commit was the first offer by Scott Frost’s staff after they got the job. The 4-star dual-threat quarterback is the perfect fit in Nebraska’s up-tempo spread offense. He is equally as good throwing the ball as he is running it. Martinez moved his official visit to Nebraska up to the weekend of Dec. 8. New defensive coordinator Erik Chinander will need a hybrid 3-4 OLB that can go get the quarterback in his defense. Allen certainly fits the bill and has an explosion off the edge that is not currently possessed by any player on the current roster. Another defensive piece that Chinander’s defense features are bump-and-run cornerbacks. Webb thrives in those situations and his size (6-3, 195) would allow him to match up physically with Big Ten wide receivers. He is scheduled to visit Lincoln the weekend of Dec. 15. The Florida blazer is an elite wide receiver prospect with offers from all over the country. He was a long-time Gators commit but expressed interest in Nebraska when Frost took the job. It would be an absolute steal to get him out of Florida and in this class. This is the first time I’ve had to put a player on the list that used to be a Nebraska commit. Goodrich has great size (6-2, 180) and is a sensational athlete. 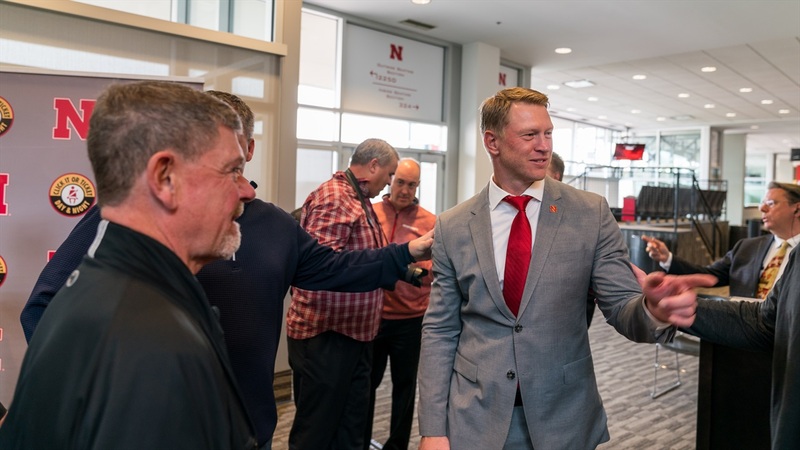 Even though he backed away from his commitment hours before Frost was announced as the coach, his talent and location still make him a must-get in this class. His size (6-5, 187) and blazing speed will make him a matchup nightmare in college. In this offense, he could be a major asset. The new staff has already done an in-home visit with him and plans to go back next week, this time sending Scott Frost. The Baylor commit seems to fit the mold of the type of player on offense that Nebraska must bring in to really make this offense go. He can play both running back and slot wide receiver in this system and has speed to burn. The hybrid tight end (6-5, 250) is very similar to tight end Jordan Akins who starred in the UCF offense this season. Nebraska will look to add a tight end like Wood-Anderson this cycle and he’s the best of the bunch. The 4-star defensive back is physically imposing at the safety spot (6-3, 190) and will come up and make a hard tackle. He is currently scheduled to be in Lincoln the weekend of Dec. 8 and the Huskers will try to make a great impression. Woodyard is very similar to Josh Fleeks in terms of athleticism. He is also versatile enough to play either running back or wide receiver, and would be used in a variety of ways. He’s ready to play Big Ten football right away, coming from Arizona Western Community College.